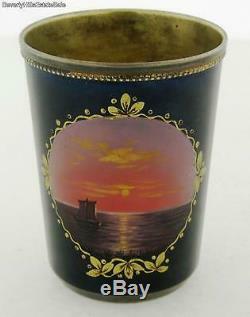 Vintage Russian Enamel 875 Silver Ocean Scene Cup. Vintage Russian 875 Silver Ocean Scene Enamel Cup. This beautiful cup has a hand-painted enamel portrait of a sail boat on a ocean sunset. The rest of the cup has a deep blue enamel. The inside of the cup has a gilt interior. It is marked 875 with Russian hallmarks. It is in good condition with one minor imperfection to the blue enamel. It measures 2 inches high by 1-1/2 inches wide. BeverlyHillsEstateSale is the creation of David Newman a second generation antique, jewelry dealer and appraiser. You may return any item for any reason if not 100% satisfied. All items offered are guaranteed genuine and accurately described. Inquire about our lay-away plan. We do not mark merchandise values below value or mark items as "gifts" - US and International government regulations prohibit such behavior. Get Vendio Gallery - Now FREE! The item "Vintage Russian Enamel 875 Silver Ocean Scene Cup" is in sale since Thursday, August 6, 2015. This item is in the category "Antiques\Silver\Sterling Silver (. The seller is "beverlyhillsestatesale" and is located in Woodland Hills, California. This item can be shipped worldwide.